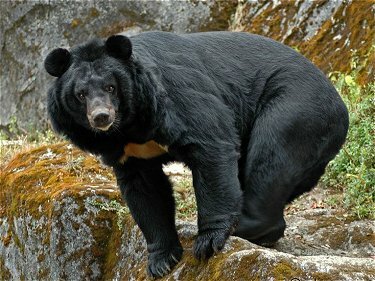 The Himalayan black bear (Selenarctos thibetanus laniger) is a rare subspecies of the Asiatic black bear. During the summer, Himalayan black bears can be found in warmer areas in Nepal, China, Russia, and Tibet at altitudes of 10,000 to 12,000 feet up near the timberline. For winter, they descend as low as 5,000 to more tropical forests. 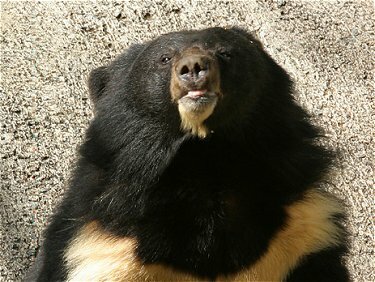 Himalayan black bears have a black coat with a light brown muzzle and a pale yellow crescent on their chest. On average, they measure from 56 to 65 inches nose to tail and weigh from 200 to 265 pounds, though they may weigh as much as 400 pounds in the fall when they are fattening up for hibernation. They are diurnal by nature, though the majority of them have become nocturnal in order to avoid humans. They often spend the day in caves or hollowed out trees. They are omnivorous creatures and will eat just about anything. Their diet consists of acorns, nuts, fruit, honey, roots, and various insects such as termites and beetle larvae. If food is scarce, they may turn to eating livestock such as sheep, goats, and cattle. Sexual maturity is reached at approximately three years. Mating is believed to occur in October with usually two cubs born in February while the mother is still hibernating. The offspring usually stay with their mother into the second year. 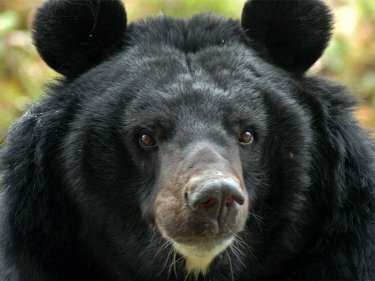 The Himalayan black bear is listed as vulnerable on the International Union for Conservation of Nature's Red List of Threatened Species.